Sailing Adventures of David & Kathy: LightSpeed to Alaska. 7000nm doesn't look so far from space. LightSpeed to Alaska. 7000nm doesn't look so far from space. 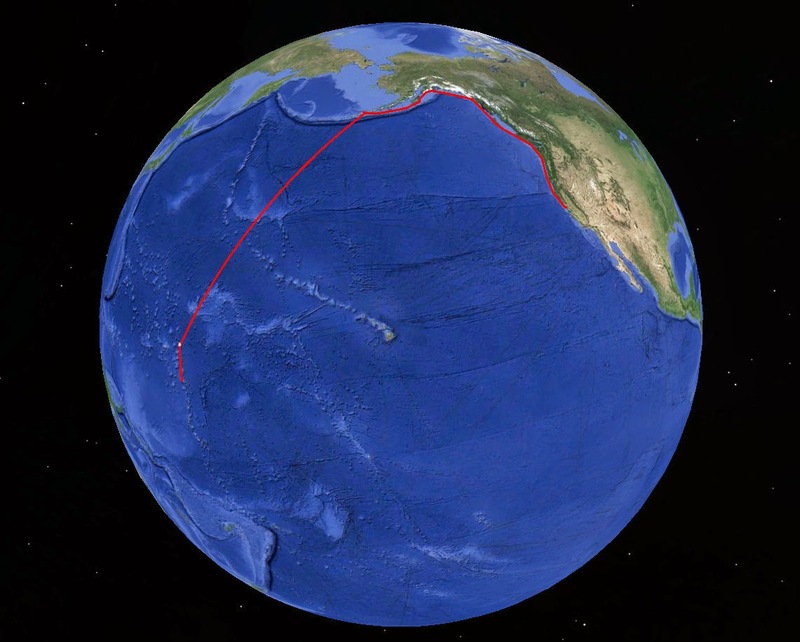 Marshall Islands San Francisco via Alaska, British Columbia, Washington and Oregon ~7000 nm. It's hot in the Marshall Islands during summer, so we're heading to Alaska to cool off. There are plenty of reasons to leave the Marshalls for summer, none the least is the chance of a typhoon as a result of el nino. On the way north we hope to stop at Bikar atoll about 300nm north of Majuro and from there the next stop is somewhere in North America, very possibly Dutch Harbor, Alaska (home of the deadliest catch crab boats). Even though it's summer the weather enroute is likely to be boisterous at times. LightSpeed is ready for the voyage with a new storm jib, 100 cone series drogue, cold water immersion survival suits, tuned up our twin Espar D4 diesel cabin heaters, closets stocked with warm clothes and cupboards full for at least 40 days of good eating. For communications we recently sold our Icom M-802 single side band radio with the hopes of replacing it with an 'Iridium GO', a satellite powered WIFI hotspot. Unfortunately the 'GO' release date keeps getting pushed back, so we recently purchased an Iridium 9555 satellite phone which we'll be using as a data modem to download weather and update the blog. I could have purchased the Iridium 9555 on ebay for under $1000, but I went with what I thought was a more reputable supplier, Global Marine Networks. Well, I paid premium price, but the purchase process has been far from smooth. The first phone provided by Global Marine Networks was dead on arrival as it would not recognize the sim card. A real shame that GMN didn't take the one minute to power it up with a sim card before sending it half way around the world! GMN customer support was quick to send out another phone and just as quick to charge my credit card for a second phone and shipping. I was also, welcome to return the DOA phone at my expense. I'd really rail on the experience with GMN, but at this point I wouldn't put it past them to disconnect my service half way into my voyage. Buy your satellite products elsewhere. Obtaining weather under-way is of vital importance to the safety of our voyage thus the reason for paying the big bucks for the new satellite phone. For email services www.Sailmail.com is still the best for both SSB and Satellite phone. A big thanks to Sailmail for all the great service over the past 8+ years. I'll be doing frequent blog updates along the way, so we hope you virtually join us for the epic voyage to the north.